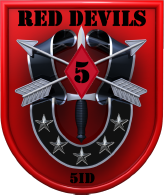 The [5ID] The Red Devils is a community of both casual and serious Tank Commanders from all Branches of the Armed Services (from Active Duty, Veteran, and Retired). Our clan prides itself on being friendly and accepting, and we are always ready to accept new recruits to [5ID]. The clan is growing, and it's Members are active most of the day. So if you are looking for a community to form Platoons, battle in Strongholds & Skirmishes, attend Training Sessions, and enter Clan Contest & Giveaways to win Gold, Premium Time, or even Premium Tanks, look no further! We try to accept as many players as we can, but we still have some basic requirements for joining our clan. If you don't meet the requirements, but still want to join [5ID], don't worry! We are more than happy to make exceptions for players if they are enthusiastic about improving, and will provide all the support you need to improve your gameplay. US Military Any Branch of Service (Retired, Veteran, or Active Duty) preferred. Have a working Mic (Headset preferred) and TeamSpeak3 for coms. At least 1,000 Random Battles. A willingness to contribute to the Team. Dedicated TeamSpeak3 Server for Our main communications. Dedicated Website to keep members informed on all Clan activity. A Rank structure that all Members can Advance through. Leadership roles in both Enlisted and Officer ranks. Distinctive Awards, for game play, Clan Achievements and contributions, Special Skill Identifiers for Groups and Skills. Special In-Game Prizes and Awards for Random and Monthly Contest. And much more. Premium Tanks also awarded. Visit our clan website, register an account using your in-game name by clicking on the "Clan Application" tab on the top Menu Bar. THIS IS NOT AN INTERVIEW OR FORMAL APPLICATION. Join Us on our TeamSpeak3 Server and get to know us. Once your Game Tags are on, you will be set up on TS3 and the Website. 5ID "The Red Devils" encourages all of its members to have fun and engage themselves in an atmosphere of Friendship. We accept all players, as long as they meet the requirements as set forth above. If you have any comments, questions, or concerns, contact PanzerFaust_65 by message In-Game. Thank you for your consideration and hope to meet you all soon. Good luck on your recruiting. Things seems to be stale on the recruiting trail at the moment.